Hopefully, the Canadian dollar slump won’t deep-six your travel plans. Although Britain can be costly, a coach trip might be worth investigating. I’ve only been on one – a very quick whip through England, Scotland, and Wales. However, the satisfying result was that I earned quick glimpses of places I might have missed, or not have had time for when wandering solo. Here are a couple of them. DURHAM, England: Drama generally surrounds sagas concerning saints – and many sinners, too now that I think about it. However, it was St. Cuthbert’s journey to his final resting place on the banks of the River Wear in north east England which fired my imagination during a 7-day Insight Vacations coach trip. After all, being greeted by a sculpture of six monks solemnly bearing a casket has to be an attention-getter for any tourist clambering off a bus and up to a hilltop city. In the late 9th century Benedictine monks fled their base in Lindisfarne, then the north eastern Kingdom of Northumbria, to escape Viking invaders. Taking with them their most precious possession, the coffin containing the remains of St. Cuthbert and the Lindisfarne Gospels, they roamed north to Whithorn in Scotland, south across the Pennines to Crayke in Yorkshire, and finally, in 883, they rested the casket at the hilly outcropping of Chester le Street. When preparing to continue their journey they were surprised to find that the casket refused to move. Clearly a sign that they had arrived at their destination, they built a wooden church around the coffin to house the body of their saint. That ancient church no longer exists, but Durham Cathedral, now a UNESCO World Heritage Site, towers nearby as a testament to St. Cuthbert (c.634-687), medieval monk, bishop and hermit. His feast day is March 20. Despite Henry VIII’s emissaries’ vandalism around 1540, grave relics were discovered and preserved. Typical of it time, Durham’s history has been turbulent and convoluted. For example, following the Battle of Dunbar in 1650 Cromwell closed Durham Cathedral in order to incarcerate 3,000 Scottish soldiers. In 2013, when nearby Durham University’s Palace Green Library was being built, two mass graves were unearthed. Research concluded that the graves were those of the soldiers. Open Treasure, a £10 development investment, opens this year. Visitors can explore the Monk’s Dormitory (the only one of its kind in England), the Great Kitchen, a wealth of exhibits along the way, plus many previously hidden spaces. A glass-sided elevator has been installed next to the monk’s staircase to make access easier for less agile visitors. Durham is a university, and market town attracting tourists, pilgrims and academics. Its dignity, charm, and aura of things-yet-to-be-discovered are undenyable. I would like to have spent longer exploring the area. Woodland and river history walks are available. Pay at the cathedral door, but book ahead online at http://www.durhamcathedral.co.uk. This site also includes an excellent video enhanced by Gregorian chants to get you in the appropriate mood. Entrance to the cathedral is by donation, preferably a large one suggests the very practical literature at the door. TINTERN ABBEY, WALES: A place of legends, and – for me luck. I’d always wanted to visit Tintern. Some forgotten reason inspired our excellent guide and driver to alter the southern part of our itinerary to include a couple of hours at this haunting abbey. I was delighted! Tintern (Abaty Tyndyrn in Welsh) was a Cistercian Abbey founded in 1131 on the Rive Wye in Monmouthsire by Walter de Clare, Lord of Chepstow. It’s commanding – now roofless – church was constructed between 1269 and 1301. Perhaps this adds to its majesty, but it must have been stunning in its day. When the Black Death plagued the country in 1348, attracting lay brothers must have been tough. Endless economic and social impacts altered the country. It is suspected it impacted the Tintern religious community, too. Tintern Abbey became another victim of Henry VIII’s Dissolution of Monasteries on September 3, 1536 when 35 monastic servants and 12 choir monks were evicted from their sanctuary. Although Tintern fell into ruin after the Dissolution in the 16th century, it remains a romantic, picturesque landmark. It has evolved into a tribute to contemplation and peace. Poets, writers, artists and photographers constantly attempt to capture what it conveys to them. Personally, on a sunny summer day I’d take a picnic and spend time photographing it while exploring this pastoral Welsh/English (Gloucestershire) border area. Being over-imaginative,Tintern whispered to me of untold tales, legends, and a long-vanished social structure. If you enjoy architecture, I have no hesitation in recommending this gracious, classic ruin. Cruising the Baltic aboard HAL’s Eurodam introduces us to a string of Northern European ports, including Tallinn, Estonia. 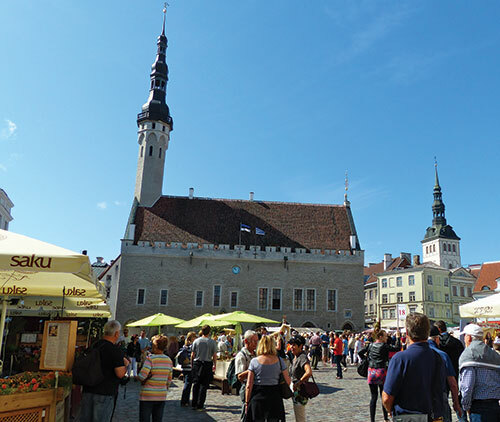 Walking from the port with shipmates, we enter its historic heart through Fat Margaret tower, part of Tallinn’s 16th century fortifications. Just inside the gate stand ‘Three Sisters.’ These 15th-century merchant houses accommodated well-travelled guild elders, councilors and burgomasters…and as a luxury hotel today, still provide lodging for globetrotters. Several early burghers’ homes remain in old town. Among these, an intricate marble façade on House of the Brotherhood of Blackheads displays black patron, Saint Mauritius, repeating on their coat of arms and above the wooden doorway. A plaque explains bachelors comprised this merchant club. These young men were routinely called upon to defend the city. Marriage permitted their membership in the Great Guild. Another guild-house features the red-white emblem of the Hanseatic League’s, a Northern European confederation protecting merchant interests in market towns like Tallinn. A 1633 clock on Church of the Holy Ghost prompts further investigations. Inside, Tallinn’s old flag recalls 13th century Danish rule. The Danes later sold Tallinn to German Teutonic Knights, who lost it to Sweden, who then lost it to Russia. Market Square bustles. We notice the still operating 1422 pharmacy, said to be birthplace of marzipan. Years later, the world’s first decorated Christmas stood nearby. Still dominating the square, the towering 15th century town hall has provided space for a courthouse, warehouse, theatre…and now a museum. Vendors in medieval smocks and headgear tend countless rows of stalls overflowing with locally handcrafted goods. Feeling a bit like far-flung traders ourselves, on the look out for unique bargains, we eye delicate porcelain dishes, examine wooden toys and finger finely woven textiles. Bypassing stylish felted hats in brilliant colours, I buy a wonderful doll for my granddaughter. And relaxing at one of many outdoor cafes, we sip robust coffees, utilize free WiFi and listen to costumed performers belting out folk music on a central stage. Proceeding to St. Nicholas Church, we discover that it served 13th century German merchants and knights. When Soviet forces bombed their early neighborhood in 1944, only this church was rebuilt. Like others, it doubles as an art museum and concert hall. In the park adjacent, men and women dressed as medieval archers demonstrate long and crossbow skills. Climbing to upper town along a cobbled walkway known as ‘the short leg,’ we investigate the Danish King’s former gardens, still bordered by the city wall and one remaining defensive watchtower. Across the street, onion-domed Alexander Nevsky Cathedral recalls the days of Russia’s imperial dominance. Toopea Castle stretches along the square’s northern side, a ‘pink palace’ enclosing Estonia’s Parliament. The national blue, black and white flag flies atop its tallest tower. Passing numerous embassies, we enter another church. Unlike others, St. Mary the Virgin is just for worship and contemplation. Memorializing German aristocrats, hundreds of coats of arms cover the walls. Through an archway, we join others at a popular viewpoint to admire ‘lower town,’ a mosaic of red tile roofs, green spires and creamy walls. Purchasing fresh-roasted cinnamon-dusted cashews from a vendor, we munch our way along the upper city wall to descend past artists painting cityscapes and a violinist passionately playing concertos. Leaving this fairytale town, we soon board our ship and at dinner toast Estonia’s enchanting World Heritage capital. Gwaii Haanas is a Haida Heritage Site, A National Park Reserve and Marine Conservation Area. Gwaii Haanas has 5000 km of rainforests, lakes and rivers and a great variety of birds. I have always wanted to visit Haida Gwaii, 640 km north of Vancouver and 130 km off the BC coast so I am thrilled that the Bill Reid Gallery of Northwest Coast Art is exhibiting Gwaii Haanas: Land Sea People from Oct. 28, 2015 to Mar. 27, 2016. The artists honour the close relationship of humans with the land and sea. Master Carver Jim Hart created SGuuluu Jaad, the ancestress of the Haida, who was the mother of all Raven People. The clans of Haida Gwaii are all descended from her 5 daughters and 5 sons. The Haida Gwaii Watchmen Program has Haida in the southern villages protecting the totem poles as they continue their life cycle of returning to the earth. It was 30 years ago in Oct.1985 that the Haida blockade at Athlii Gwaii, Lyell Island occurred, putting an end to the destructive logging practices. 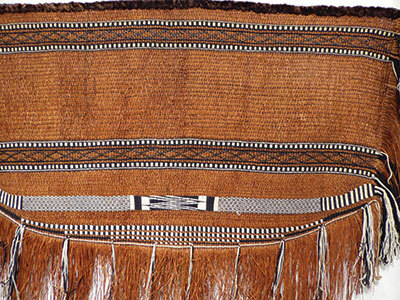 Four elders were arrested at this time and their ceremonial robes are displayed. 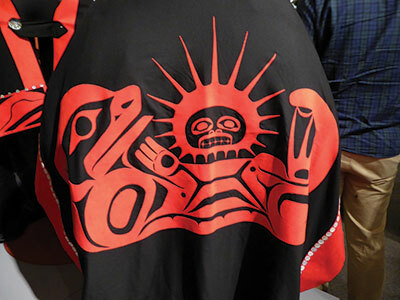 The Archipelago Management Board robe is worn by the superintendent of Gwaii Haanas during ceremonial events. The sea otter depicted represents the area for sustainable management. The Archipelago Management Board consists of 6 directors of equal representation from the Haida nation and the Government of Canada. During the 60s, 70s and 80s artists including Bill Reid, Joe Plaskett and Jim Willer sailed around Gwaii Haanas on the Skipjack troller, skippered by Bill Ellis. Bill Reid’s engraved silver bracelet depicts “Bill and Bill on the Skipjack and the image of Joe Plaskett’s pastel “a View from Ninstints” was made into a Canada Post stamp in 1980. Victoria Moody, a weaver from Skidegate created the Transition Robe 2000 which features both wool and red cedar. The red cedar bark was collected from 6 Haida totem poles that were raised for the Haida Heritage Centre at Kay Linagaay. Bull kelp canopy creates a home for sea creatures. 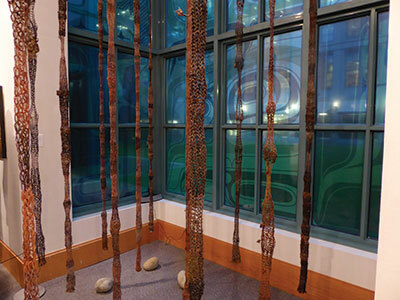 Kathy Pick used spool knotting to create the delicate kelp columns. I also viewed the Great Box, a replica of a beautiful, antique bentwood box and a cultural treasure. This exhibit provided a lovely interlude on a rainy Vancouver afternoon. By Christine Cheng, R.Ph., and Fred Cheng, R.Ph. Mapping every available washroom along one’s daily routine is a reality for many women of all ages who experience some form of urinary incontinence. It is estimated that nearly 10% of Canadian women are affected and although it is often assumed that incontinence is a normal part of aging and only the elderly are affected, this is not always the case. “Stress incontinence”, the involuntary leakage of urine when a person coughs, sneezes, strains or makes a sudden movement, can result when the muscles and tissues around the opening of the bladder get weak. This weakness occurs when the muscles get stretched, which can be caused by injury, weight gain, pregnancies and/or vaginal births. Another common type of incontinence is “Urge incontinence” which is the accidental leakage of urine that is accompanied by a sense of urgency. Even the sound of running water may trigger the leakage of urine and sufferers may find themselves running to the washroom even if their bladder is near empty. This type of incontinence is associated with spasms of the bladder muscle due to damage to the nerves or muscles in the area, which could be caused by stroke, an infection or inflammation of the bladder. Those who have “Mixed incontinence” experience a combination of the two types described above. The more commonly known remedies include wearing incontinence briefs and/or doing Kegel’s exercises to tone the area. Others may turn to prescription medications to help with the symptoms, then be dissatisfied with the side effects these can cause. Thankfully, there are several other options including SAGAPRO, a preparation of the Icelandic herb Angelica archangelica that works by calming bladder muscle contractions which allows the bladder to distend further. Sagapro has been highly successful in many of our clients. It is taken once daily and is well-tolerated with no known side effects. Benefits are typically seen in about a month or less. Another option is the homeopathic “INCONTINENCE COMPLEX” that has been used quite successfully to address incontinence in many species (yes, dogs, cats, horses, humans…). This is also taken orally, typically two-three times daily and is very safe and well-tolerated. Results can be expected in a matter of days. For those in whom Kegel’s exercises does not provide adequate relief, using electrotherapy to stimulate the pelvic floor muscles to improve their strength and endurance may be the answer. The ELISE PELVIC FLOOR STIMULATOR FOR INCONTINENCE is a discreet pelvic floor exerciser that is designed for home use and—– provides different electrotherapeutic programs to help with Stress, Urge and Mixed incontinence. There is also a “Tone” program used twice weekly to help maintain the benefits achieved from daily use of the other programs. Results can be seen in as little as two weeks for those using it for Urge incontinence and in as little as one month for those experiencing Stress incontinence where the muscles will need more exercising. The Elise is safe, pain-free, easy to use, and drug free. Incontinence is not necessarily a part of normal aging. Come speak to one of our knowledgeable pharmacists to discuss the possible solutions. Christine and Fred Cheng are a passionate, charismatic sister-brother pharmacist team at their unique, family-owned and operated Pharmasave in Cloverdale, B.C. (open 7 days a week). They specialize in natural remedies and compounding for both human and veterinarian use. Everything mentioned in their article is available InStore. Surrey Cultural Development Advisory Committee (CDAC) members replaced their January board meeting with a three-hour brainstorming workshop at Surrey City Hall. Stickhandling the culturally rich power of British Columbia’s rapidly growing second largest city requires cooperation, imagination and dedication. How best could the 14 organisations represented channel our communal efforts to profile, promote, support, and continue to build the future of what has evolved into a festival city. Established four years ago by dedicated arts supporter Councilor Judy Villeneuve, we meet monthly to share city arts scene updates. Province-wide delegations regularly make presentations hoping to feature in Surrey’s expanding arts calendar. ‘Stickies’ festooned idea boards generating spirited discussions, questions and clarification from attending city staff. More theatres, requested one member. Increase First Nations presence, lobbied another. Affordable, easily accessible, space for artists is critical. How to address that? How best to promote events within the city limits, and beyond? Grants, funding, partnerships, priorities, tourism, visioning – the stacks of Post-It Notes were put to good use. So, what’s on the 2016 calendar so far? The Fusion Festival! Look for this vibrant event July 23-24 in Holland Park. April 23 is Vaisakhi Day (New Year on the Sikh calendar). The Surrey Khalsa Day Parade, the biggest in Canada, welcomed 300,000 visitors of all religions and cultures last year. A colourful parade, mouthwatering foods, dancers, and more, have put this event on the map. Check www.surreyvaisakhiparade.ca for details. Surrey Libraries, and SFU’s Surrey Campus, regularly host literary workshops and presentations. Ask about genealogy records, and family history programs at Cloverdale Library. Remember Surrey Museum’s Children’s Interactive Gallery in Cloverdale. Free admission courtesy of The Friends of the Surrey Museum and Archives Society. Open Sundays. The Ultimate Traveller series, new this winter, begins with ‘In the Footsteps of the Incas – A Cultural & Photographic Tour of Peru’, Sunday Feb. 21 at 2.30 p.m. in the Museum Theatre. Noted international photographer and historian, Peter Langer, never fails to impress. Check www.theultimatetraveller.com. In 2015, the talented Renée Sarojini Saklikar was welcomed as Surrey’s inaugural Poet Laureate. A Surrey Public Library and Surrey Council literary arts initiative. Don’t forget Surrey Little Theatre, which is battling for survival due to encroaching road and construction expansion, and our excellent theatre neighbours in Langley, White Rock and New Westminster. Canadian currency may be down, but local artistic currency is up – and it’s a good investment. Q: I would like to know exactly what a tankless water heater is. What are the benefits and why would I get one? A: Tankless water heaters are capable of providing an instant, endless supply of hot water. Because these systems function on an on-demand basis, they do not require a holding tank to store pre-warmed water. No storage or holding reserve means that tankless water heaters have a life span that is twice as long as traditional systems because of the risk of rust and corrosion is significantly lowered. They are hung from the wall saving floor space. They can be installed anywhere an outdoor exhaust vent can be provided. Most have warranties up to 15 years with all parts being replaceable and 100% recyclable. They do cost more initially but looking at all the benefits including the re-sale value of your home, they are well worth the expense. A tankless hot water heater will save you money, save space and you will never run out of hot water again. Best of all your home and family will be environmentally friendly. Note: Recommended in households with large families requiring more showers. Electric units heat the water as it passes over an electrical element. To run an electric tankless water heater, you will need to have it hardwired to your circuit breaker/electrical panel. In most cases you will require a new 40 amp service. Although, electric tankless water heaters are less expensive to purchase and operate the cost to install and provide electric service could be prohibitive. Tankless water heaters may slow down the water volume due to the water being heated on the move. Have the technician explain cost effectiveness in relation to the number of people in the home. In a gas unit, a gas burner is utilized to heat the water. Gas-powered systems are fueled by propane or natural gas. To operate one of these units, you will need a gas line running through your home to where the water heater will be installed as well as a larger vertical vent to the outside or combustion and condensation venting through an exterior wall. It can easily provide endless hot water for one major application at a time. This unit is a great replacement for the traditional 40-gallon storage tank water heater. Again I would suggest discussing cost effectiveness with the technician. Cruising through the Panama Canal to San Diego aboard the Veendam offers us memorable Central American destinations, including Antigua. 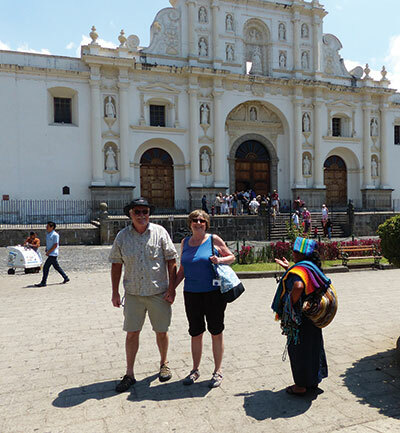 After a scenic ninety-minute coach-ride through rolling green countryside, we arrive in Guatemala’s World Heritage city. “Welcome to our colonial capital and heart of the Mayan world,” smiles guide Karen. Along narrow raised sidewalks, our walk winds past several earthquake-damaged buildings. Cobblestone streets bustle with pedestrians and traffic. Villagers often approach to sell hand-woven textiles, musical instruments and jewelry. Two short bell towers flank Church of Mercy’s white-filigreed, yellow façade. Atop, we sight San Pedro Nolasco, 13th-century founder of this Catholic order. Blessed Virgin Mary of Mercy stands in the central niche. Of two saints standing on her left, one holds a rope recalling his martyrdom. To her right, a bishop and the order’s first nun. Inside Antigua’s first monastery, we learn these Mercedarians helped heretics escape the Spanish inquisition and supported families of convicts. In turn, appreciative prisoners created the mosaics we see decorating stout interior columns. With wide arches, the sanctuary and cloister withstood earthquakes such as the one that destroyed 3,000 buildings in 1717. Constructed in 1554, Saint Joseph Cathedral now stands in baroque splendor. Destroyed repeatedly by earthquakes, only the front remains. Skeletal ruins behind recall its original grandeur. Here we see the tombs of Bernal Diaz, diarist of the Spanish conquests and Pedro de Alvarado, Cortez’s second-in-command, who became Guatemala’s first governor. His powerful consort Luisa was a Tlaxcaltec Chief’s daughter who protected native communities. Karen points out her underground shrine where Mayans come to light candles. Exiting past 17th-century university buildings, we enter Santo Domingo Monastery founded in 1538. Devastated by the Santa Marta earthquake and abandoned for centuries, it once boasted two towers with ten bells. Much of this city suffered similar destruction, so authorities moved the capital to Guatemala City in 1776. Part of this demolished monastery has become today’s Hotel Casa Santo Domingo. Seated at tables amid its lush gardens, we enjoy a Guatemalan lunch of rice, black beans, chicken, beef, guacamole and handmade corn tortillas. An onsite Art Gallery exhibits recovered monastery treasures, an interesting collection of religious art and artifacts. Before leaving we admire a magnificent Ceiba tree, the Mayan tree of life. Believing branches form crosses to ‘show the way;’ Spanish priests promoted Christianity through such native lore. An archaeologist at the Jade Museum provides an overview of Mesoamerican jade. Showing us replicas of famous pre-Columbian relics, she discusses importance of jade for over 3,000 years in cultures as far away as Costa Rica and southwestern Mexico. While sampling aromatic Guatemalan coffee, we watch workshop artistes design jade objects for the showroom. There, we find Mayan glyph pendants for birthdays, bracelets and necklaces in dazzling colours. I opt for droplet earrings in pale green. 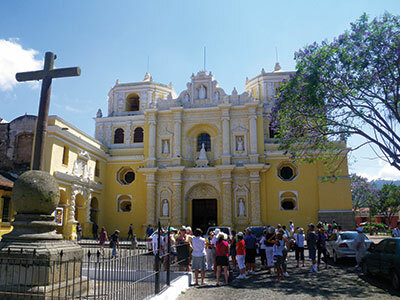 Antigua’s architecture, historic insights, culinary delights and my jade memento make a wondrous daytrip. 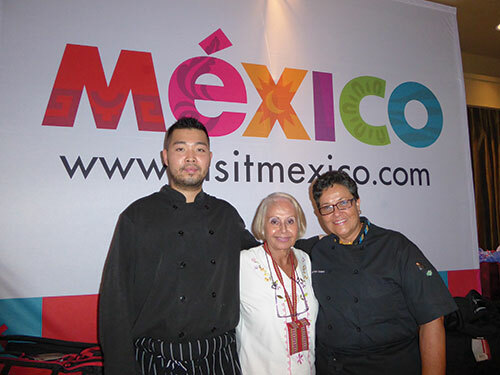 MEXICAN GOURMET EXPERIENCE WITH CHEF BETTY VAZQUEZ. After a trip often it is the memories of the food and wine we experienced, that lingers, rather than the material purchases, since we tire easily of the things we own. In Nov.2010 UNESCO honoured Mexico for its gastronomy as part of their “Intangible Cultural Heritage”, reflecting traditions passed down from generation to generation. 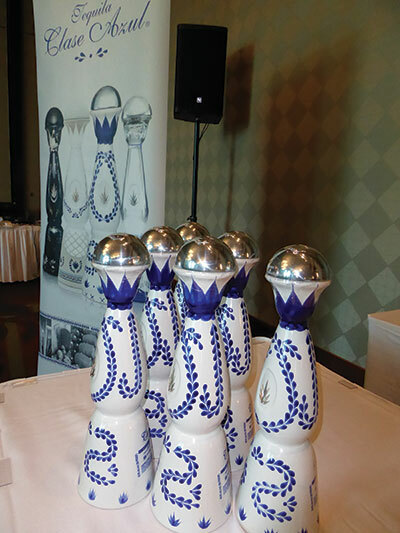 Therefore I was thrilled during MEXICOfest on Sept 9, 2015 that Chef Betty Vazquez brought Mexican Culinary Tourism to a gala in the Richmond Country Club. Exec. Chef Betty Vazquez runs El Delfin Restaurant in the family’s Garza Canela Hotel in San Blas, north of Puerto Vallarta in Riviera Nayarit. Originally Chef Betty trained as an airline pilot but food was her passion. At Texas Univ. in Houston, she studied Hotel Hospitality and continued with the University Culinary Arts Program at Cordon Bleu in Paris. Having travelled internationally learning about the cuisine in New York, France. Spain and Italy, Chef Betty created a fusion of flavours, making her Mexican menus more dynamic. Chef Betty told me she was delighted to work with the Richmond Country Club’s Chef Fabien Angeard and his multi-national staff preparing the 4-course menu. For the 1st course, in honour of BC, Chef Betty constructed a BC salmon only, fish ceviche scented with tequila and mixed with red onion, serrano pepper, parsley, sea salt and lime juice with a drizzle of crumbled toasted tostados lining the plate. Poblano pepper is a mild chile, sweet with subtle heat and is named after the State of Puebla. The Tomatillo or Mexican husk tomato was part of the culture of the Maya and Aztecs. Hierba Santa, meaning sacred leaf in Spanish, has a heart-shaped velvety leaf with an aroma of eucalyptus and mint. 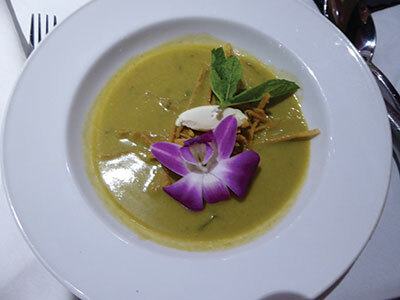 The 2nd course, a Poblano Pepper Cream Soup, blended poblano pepper, green tomatillo, hierba santa, pumpkin seeds, onion and garlic and was topped with an oval goat cheese quenelle, tortilla strips and an edible purple flower. Chile guajillo is sweet with a hot finish and chile de arbor, tree chile or bird’s beak chile, is thought to be traceable to cayenne pepper. For the main course I chose Sablefish in 2 Dried Peppers Sauce and another guest chose the Angus beef with the same sauce combining chile guajillo, chile de arbol, cumin, oregano, onion, garlic, tomatoes and orange juice. The same sauce went well with both the meat and fish. Peller Estates Merlot with flavours of cherry, black tea and spice paired well with the Angus beef and the Sablefish was paired with the Peller Estates Chardonnay with hints of vanilla, oak, pear and honeysuckle. When in Mexico, I like to buy pure vanilla. Vanilla is derived from orchids of the genus vanilla and mainly from the Mexican species, flat-leaved vanilla. Apparently Hernan Cortes introduced vanilla and chocolate to Europe in the 1520’s. Vanilla is the 2nd most expensive spice after saffron, since hand-pollination is required to set the fruit, from which the flavoring is obtained. How appropriate it was for our dessert to be Vanilla cake and Chocolate ganache with chile de arbol. Our beautiful meal was made even more enjoyable learning about the history of its ingredients. Muchas gracias. By Christine Cheng, R.Ph. and Frederick Cheng, R.Ph. The changing colours of the fall leaves are an indication that cold and flu season is upon us. Although for most people, these are not life-threatening illnesses, they can make your life miserable, especially during the holiday season. Protect yourself from the cold and flu by following these simple steps. At the top of the list are some non-drug options. Stay well-hydrated, eat your fruits and veggies and ensure adequate protein intake because all of these actions will help your immune system function optimally. Wash your hands frequently, even if you do not feel they are dirty. We inadvertently touch many surfaces throughout the day and then touch our faces, risking the introduction of viruses and bacteria into our body through the eyes and nose. Simply washing your hands several times throughout the day can minimize your risk of exposure to cold or flu viruses. Getting a FLU SHOT is one of the best ways to minimize the impact of the flu virus on your body. Notice we do not say that it prevents you from getting the flu as that can only be achieved by not inhaling droplets containing the virus. The flu vaccine works by showing your immune system parts of the flu virus and stimulating your body to produce antibodies and other killer cells that fight the virus. Then if your body does encounter the live virus, you will already be armed with the weapons to fight it. Thus, the flu shot does not prevent you from getting the flu, rather it minimizes how sick you feel since the body is able to fight it before the virus causes you to be symptomatic. You may have heard that some years the flu shot does not cover the strains of influenza that are found to be the problematic in our area that year. However, that is not say that the flu shot did not do them any good at all as those who were vaccinated now have antibodies in them that would protect them when these strains do come around our area during future flu seasons. Come talk to us about getting vaccinated. Supporting the immune system can help prepare it for its fight against seasonal viruses. For those who have a contraindication to the flu shot or choose not to receive it, or as additional protection against the flu, consider using THYMULINE and INFLUENZINUM on an alternating schedule to balance and prime the immune system homeopathically. Additionally, most of the Cloverdale Pharmasave staff keep ESBERITOX on hand during the winter months. Chewing a few tasty tablets three times a day at the onset of a cold can reduce the severity and duration of cold symptoms. For those who prefer a liquid, PASCOLEUCYN is used in much the same way. Both Esberitox and Pascoleucyn can be used by almost all the members of the family with dosing provided for as young as 4 years of age and infants, respectively. The family of SAMBUCUS products all contain a cultivar of black elderberry that is reported to contain higher levels of naturally-occurring flavonoids, which supports the immune system. Black elderberry is a traditional remedy used to help reduce the severity and duration of flu symptoms. It is combined with Echinacea in the SAMBUCUS IMMUNE product for relief against both the cold and flu. Although the forecast is for El Nino to bring us a mild winter, this does not necessarily translate into a mild cold and flu season. Protecting yourself against the winter viruses can also help protect the more vulnerable members of our population such as the very young, the very old and those who are immune-compromised. Do your part in keeping everyone in your family healthy during the cough and cold season: wash your hands, eat healthy, get a flu shot, and use complementary medicines as necessary. Q: We like to leave our bedroom windows open at night rain or shine. sound coming from the gutter down spouts. Is there a magic solution? A: Yes, that can be a very annoying sound which only seems to get louder and louder as the night goes on. This dripping sound will occur where gutters are installed at locations where there is very little or no overhang to require elbows to run the water back to the side of the house and down. Without any elbows water is allowed to run directly from the gutter into the vertical down pipe sometimes dropping 8 feet before being directed to the drain spout or perimeter drainage system. When the water changes direction at this lower elbow it makes a loud dripping sound. To correct this take a length of brass or galvanized 1 inch link chain and dangle it down in the down pipe to the elbow. Secure the chain by placing a 6 inch galvanized common nail through a link of the chain and bridging the downspout opening keeping the chain at the side of the gutter. This will force the water to run down the chain breaking the fall of water and silencing the dripping sound. If water is entering the downspout from both sides at the top you will need to loop the chain before putting the galvanized nail through allowing the chain to touch both sides of the downpipe. This will force the water to run down the chain from both sides. Q: I live in a very nice 30 year old townhouse. My problem is squeaky floors. I plan to have new carpets installed in the near future. Is there anything I can do before laying the new carpet to prevent the squeaking. A: Yes there certainly is and now that you are installing new carpet it is the perfect time to get rid of the squeaks. Using 2 inch wood screws tighten the plywood underlay to the floor joists before installing the new underlay and carpet. Note: do not use drywall screws. You must use wood screws placing them 12 inches apart.